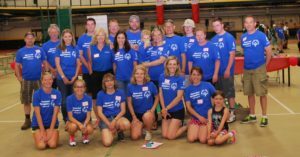 Union Mutual, a central Vermont-based insurance provider, will present the 2016 Special Olympics Vermont Summer Games June 3-5 at the University of Vermont, extending its lead sponsorship through the 2018 Games. Athletes will compete in swimming, track and field, bocce, and softball. Summer Games is Special Olympics Vermont’s largest competition event of the year featuring nearly 500 athletes representing every Vermont county. The weekend begins Friday, June 3 with Opening Ceremonies in Patrick Gym and the culmination of the Law Enforcement Torch Run. Opening Ceremonies will also feature guest speaker Andy Newell, a Vermont native sponsored by Union Mutual and three-time Olympic Nordic skier who has been competing internationally on the World Cup stage and in World Championships for the past 10 years. A large team of Union Mutual volunteers will run Olympic Town activities and the award ceremonies throughout the weekend.